Flame Seal Products, Inc. (FSP) wildfire products FS-PG (Perimeter Guard) provided real-world proof of effectiveness in the devastating California Woolsey Wildfire. The dramatically increasing incidence and severity of California wildfires demands effective protection for life and property caught in the path of these rapidly expanding infernos such as the Woolsey fire. For almost two weeks, this blaze spread to 97,000 acres, consumed 1,643 structures, killing three and destroying hundreds of high-end homes in Malibu. Fortunately, a farsighted homeowner in Latigo Canyon, who had installed a FS-PG sprinkler system, deployed the system which covered his house and grounds, as well as enough overspray on an adjacent neighbor’s house to save it. FS-PG protected the homes, a car parked outside, and even the portion of his landscaping covered by the retardant while all surrounding structures beyond the Perimeter Guard sprayed area were destroyed. 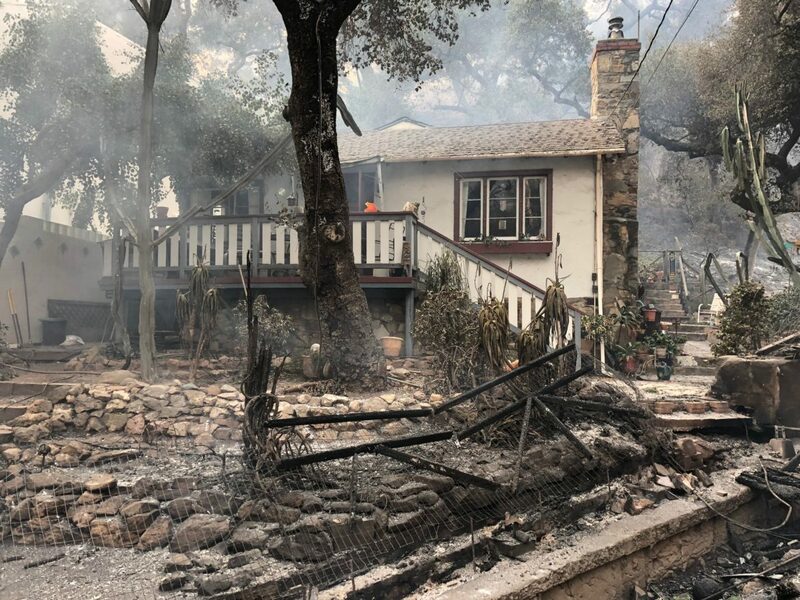 This reported information comes from onsite inspection by Flame Seal’s Dylan Nowak and Ron Hodgson, our California Wildfire expert consultant. All this provides additional proof, that FS-PG works under extreme conditions to save property and possessions. The technology can be applied to prevent the devastating effects to structures in wildfire prone areas. Without wildfire protection, such as Perimeter Guard, these areas may become extremely dangerous and uninsurable. Millions of Californians are in harm’s way in what is known as the wildland/urban interface (WUI). Flame Seal’s FX-WF and FS-PG installations and products should be a major part of the solution to prevent the loss of life and whole neighborhoods such as Malibu, Paradise, Redding and Santa Rosa in 2017. The FS-PG fire retardant can be applied in several ways. If investing in a storage and sprinkler distribution system is prohibitive, the product may be applied around the perimeter of your home with a simple backpack sprayer available at local hardware stores. Please visit our website for more information – www.flameseal.com. Wild Fire Protection Services (WFPS) is the national distributor for Flame Seal in North America. WFPS plans to expand marketing efforts for FX-WF and FS-PG storage and delivery systems in wildfire prone areas. FS-PG™ Perimeter Guard is a proprietary powder designed for dilution in water and applied as a passive fire retardant to the natural areas surrounding the perimeter of homes and other landscaped areas. Unlike other common fire retardants, FS-PG™ is a stable, non-separating solution, always ready for deployment. The product is applied to dry grasses, brush, wood and other cellulose type material, with minimal effect on the environment. The product has been developed to protect the ignition zone outside of the perimeters of structures or landscaped areas during wildfires. The product is a passive fire retardant and can be applied at the beginning of the fire season and will remain in place and effective unless rained upon or otherwise exposed to water. When areas treated with FS-PG™ are exposed to fire or extreme heat, the vegetation or wood forms a carbon-char, which interferes with combustion and prevents fire propagation. FX-WF™ is a single component, non-permanent, ready to use, fire protective coating. It is designed for application to structures in the immediate path of a wildfire. It can be applied up to several days, depending upon conditions, before the arrival of a fire. On exposure to fire, FX-WF™ produces thick intumescent foam, which acts as a heat and fire barrier, protecting the underlying structure. The coating “swells up” nearly 100 times in thickness when the heat of a fire approaches, therefore protecting and insulating the structure from the fire. By using FX-WF™, the chances the structure will survive greatly increases. The product can be purchased at the Flame Seal on-line store, www.flamesealshop.com. Contact Dylan Nowak at [email protected] for more information. Facebook, also, has pertinent information about Flame Seal products, including video and photos at https://m.facebook.com/Flamesealproducts/. As we gather more information about the Latigo Canyon house in Malibu, we’ll be posting on Facebook. Flame Seal Products, Inc., manufacturer of the world’s number one fire prevention technology, was founded in 1992 as a research and development company focused on the investigation and application of passive Fire Prevention Technologies. FLAME SEAL PRODUCTS, INC. (FLMP) began trading its common stock on March 27, 2000. Flame Seal Products, Inc. is also the Transfer Agent of record. The company offers a wide variety of Code Driven solutions for a number of diverse applications and industries, and has developed three passive fire prevention technologies which are the basis for the company’s products. For more company and product information, go to: http://flameseal.com. For publicly disclosed information, go to www.otcmarkets.com – symbol FLMP. All press releases regarding FLMP results and corporate updates can be found in the “News” section and all financials are in the “Filing and Disclosure” section.